Buying the perfect bridal gown has been a tradition for many brides. Recently many brides are beginning to rent their bridal gowns. It can be cost effective to rent a gown, it allows the bride to save money. Bridal gowns can be rented in a variety of styles and sizes. Many rental shops also offer veils,shoes and jewelry available for rent with the gown. Some shops will allow the bride to do some alterations to the gown before the wedding. Renters should be aware of any deposits or damage fees before signing a rental agreement. If you are planning on leaving immediately from the reception to your honeymoon destination, have a family member or a friend return the gown to the rental shop. 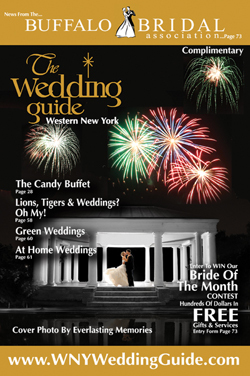 The WNY Wedding Guide can provide you detailed local information and help you choose a dependable bridal gown rental shop.